Wetland, boggy area, marshland, in our region there are so many names used to designate a land filled with water. But what exactly is a peatland? A peatland is a land filled with water, poor in oxygen and nutrients. In this environment, the decomposition of plants is slow and they accumulate to form peat. Labelled as a Natural Sensitive Site by the local authorities of the Cher, La tourbière de la Guette hosts an exceptional flora as well as fauna, protected both regionally and nationally. 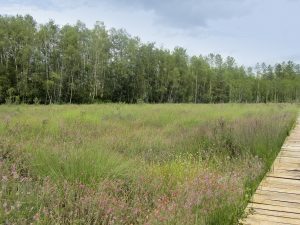 With an area of 23 ha, it is Sologne’s biggest peatland! La Tourbière de la Guette is a wildlife reserve but also a tool for scientists as well as a water and weather regulator Find out more about la Tourbière de la Guette? A guided stroll or on your own? Walk on your own: a freely accessible all year wood slatted path enables you to explore and observe without getting your feet wet or damaging the protected plants. Displayed signs and pannels will help you better understand as you walk. Be careful: we invite you to respect the posted rules. Plan to wear weather appropriate shoes and clothes. Free guided visit: Along with a guide, learn more about the unseen world within the peatland and its essential role.